The driver of a coach who was drunk when it overturned at an M1 service station in Buckinghamshire injuring 33 people has been jailed for 10 months. Leslie Weinberg, 35, was cut from the wreckage of the National Express coach when it crashed at Newport Pagnell Services on the M1. 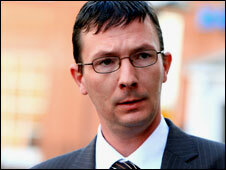 Weinberg, formerly of West Bromwich, pleaded guilty at Aylesbury Crown Court to driving dangerously. He admitted driving with excess alcohol and was also banned for four years. Weinberg had a drink-drive reading of 145mg of alcohol in 100ml of blood. The legal limit is 80mg per 100ml. He had returned from holiday the day before the crash and had stayed up all night drinking alone. He then drove the coach on a regular service from Birmingham to Stansted Airport, the court heard. After overtaking a lorry on the approach to a junction on the M1 he cut inside but mistook the entry road to the service station for a slip road off the motorway. The coach tachograph showed he was travelling at 57mph (92kph) when he left the motorway. 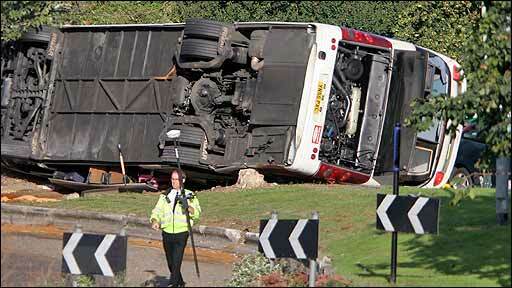 The coach hit a kerb and passengers later said it took off before turning on its side and sliding. After overturning the coach hit a tree and a lamppost. After the crash, on 3 September 2007, casualties were treated at hospitals in Northampton, Milton Keynes and Oxford. Seven passengers suffered serious injuries, including one man whose arm was amputated. At Aylesbury Crown Court, Weinberg was also fined £500 and disqualified for two years for dangerous driving, to run concurrently with the four year ban for drink-driving.